The Junior series is the compact product line of Custom Service Crane construction lifts. These models are particularly characterized by their space-saving design. At the same time they can be towed by almost any regular passenger car. 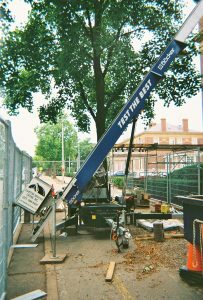 The best locations for the Junior lift are narrow construction sites where there is hardly any space. The model is especially strong in these surroundings and clearly surpasses all regular construction lifts. 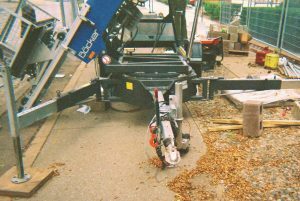 Retractable axles are available as an option; with this feature the width can be reduced from 4.26 to 2.91 ft, and your lift fits through narrow alleys and even regular doors. In addition, a retractable coupling can reduce the required space even further. Despite the compact dimensions and the minimum required space, the Junior series is still a full-fledged construction lift. With a maximum payload of 660 lbs, the Junior offers full performance. Furthermore, a mechanical buckling rail and an extension are available as options to help you to transport all necessary goods and materials on the roof. That way you do not have to make any compromise regarding performance, even if you choose one of Custom Service Crane’s compact Junior models. 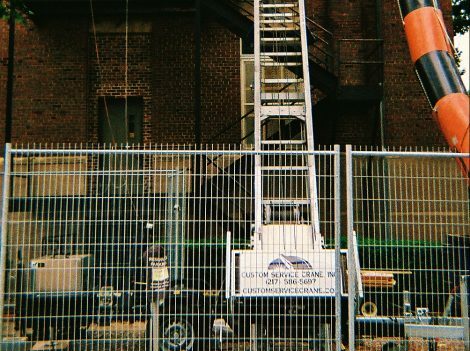 Beside these particular strengths, the Junior series is also characterized by the typical strengths of Custom Service Crane construction lifts. The compact models benefit substantially from the long-time experience of the company concerning crane and lift technology. Therefore you get a fully developed product with the famous Custom Service Crane quality, including the latest technology. 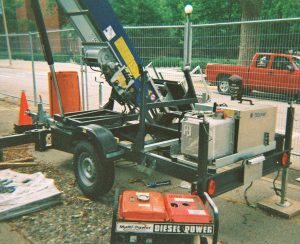 Accessible yet sturdy, the Boeker HD 26/1-6 has been ideal on our University of Illinois campus, such as the job above pictured at the Chemistry Annex building.